Bikes featuring a retro-styling seem to be all the rage these days, with even high-tech ebikes cashing in on the trend. 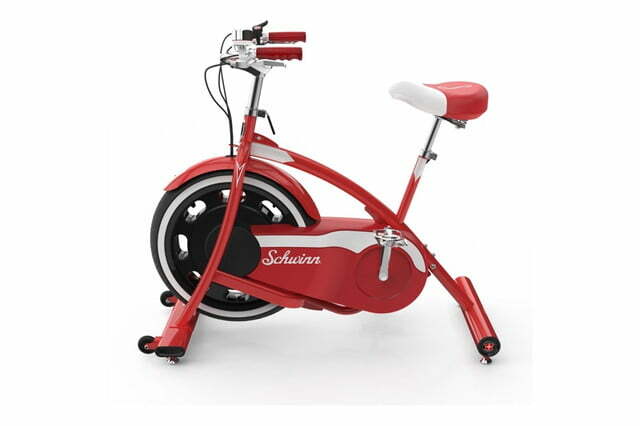 Now, Schwinn has taken the throwback design aesthetic one step further by introducing the new Classic Cruiser, an indoor exercise machine that looks like something straight out of the 1950s, but is packed full of modern technology. At first glance, the Classic Cruiser looks like a vintage bike that had its rear tire removed. 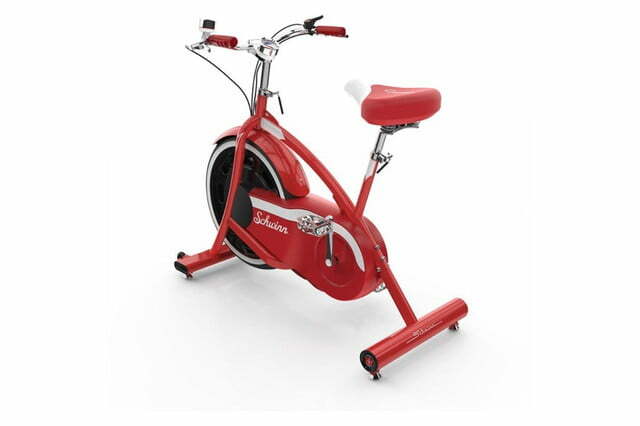 It features a bold, bright-red paint job, wide fenders, and a thick tire, along with a classic spring-loaded seat like those commonly found on traditional beach cruisers. 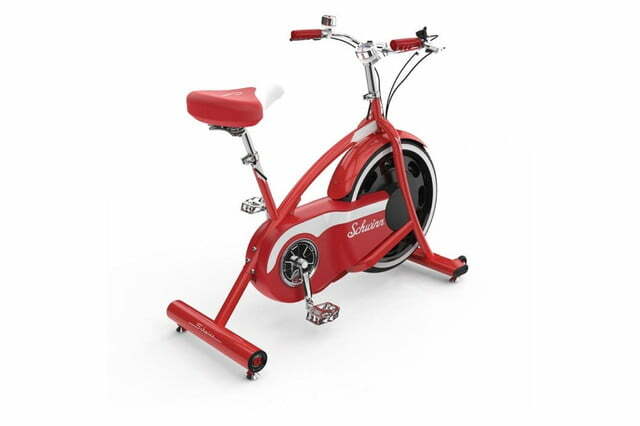 It even has a traditional dial speedometer to let riders know how fast they are pedaling and a matching workout timer, along with a retro gear switch mounted on the handlebars within easy reach of the rider’s thumb. But when you look a bit deeper the Classic Cruiser’s tech elements begin to show. For instance, its seven-speed drive system uses electromagnetic resistance and is reportedly whisper quiet, something that is much appreciated when riding indoors. 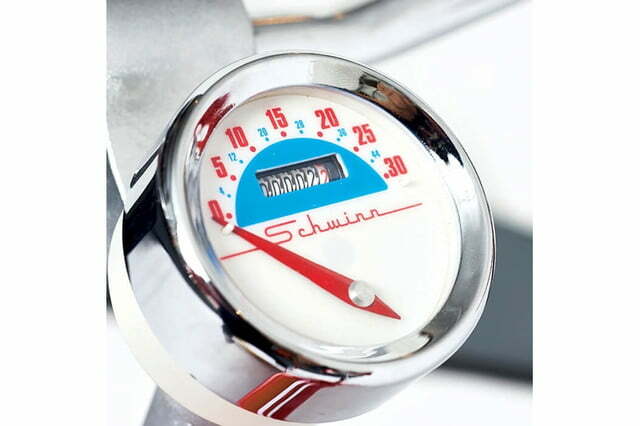 The bike even tracks speed, time, distance, and calories burned, all of which can be shared to the Schwinn Classic Cruiser smartphone app, available for both iOS and Android. That same app comes with a built-in feature that allows riders to pedal their way around a virtual 1950s town, avoiding obstacles while also delivering papers. 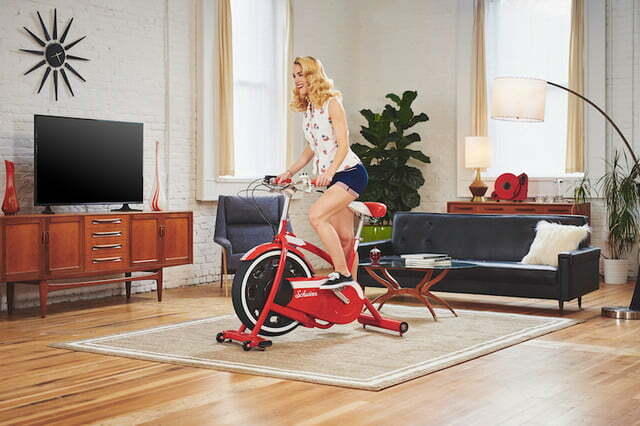 Technology is such an important part of the Classic Cruiser that the exercise bike actually ships with a media shelf built to securely hold a tablet. 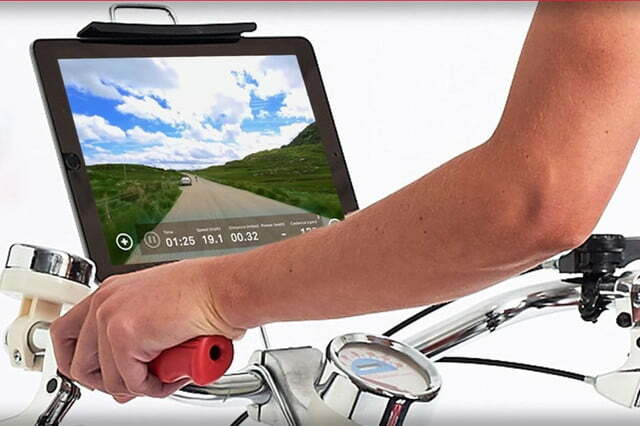 The bike is also compatible with the RideSocial app (iOS/Android), which gives users even more virtual environments to explore, including cycling routes through Death Valley, Sequoia National Park, and Tibet. Other handy features include preprogrammed workouts to help riders achieve their fitness goals and compatibility with popular cycling apps, such as Zwift, for sharing exercise metrics. The Classic Cruiser even comes with built-in wheels to help move it around more easily. Available now and priced at $800, the Schwinn Classic Cruiser delivers a lot of bang for the buck, particularly if you appreciate its vintage looks.